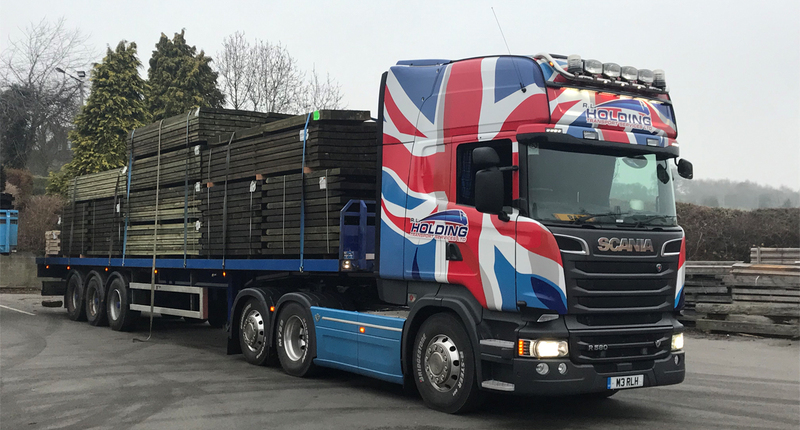 A whole load of Great British Timber being delivered in an appropriately liveried vehicle. In fact, the vehicle is from the fleet of our new haulage partner RL Holding who are registered under the FORS Scheme, taking a load of post and rail fencing, treated to Highways Agency standards, to the A14 improvements for our Customers Alan Mulligan Fencing. The Fleet Operator Recognition Scheme (FORS) is a voluntary accreditation scheme for fleet operators which aims to raise the level of quality within fleet operations, and to demonstrate which operators are achieving exemplary levels of best practice in safety, efficiency, and environmental protection. So, it’s a case of best practice transport for best practice timber!